House, 3	Bedrooms, 2 Baths, Sleeps 6, with boat dock. Lovely 3 bedroom, 2 full baths home. Bring your fun, your food and drink, everything else is furnished. 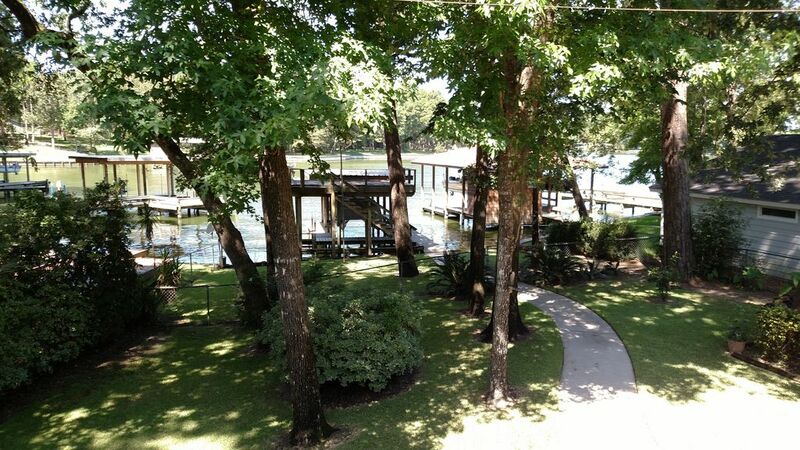 The home is on the shore of beautiful Lake Livingston with a lighted dock for fishing, or docking your boat. Private boat ramp within the neighborhood to launch your boat. The living room, kitchen and dining room are downstairs. Wooden deck facing the lake for wonderful sunsets and bar-b-que on the gas grill. Smoking is permitted outside only as this is a smoke free home. Upstairs balcony, off of bedrooms, for watching the birds and squirrels, while enjoying your morning coffee. A lovely fenced in back yard, for the safety of your children and pets. Fishing is always good. Come and enjoy. House is located on the shore of Lake Livingston. Good fishing and boating. Very good swimming, sandy bottom at the property. Water is shallow near my dock, great for young kids. Nice home w/ a very nice owner on a quite cove. Very much enjoyed our stay over Thanksgiving. The weather was a bit cool for swimming but thoroughly enjoyed the house and the stay. The owner was very close at hand and very helpful. Excellent internet access. Thank you, I enjoyed your stay and conversations. Glad your son caught fish. The spacious house was very comfortable and all we needed to take was food. A very beautiful house right on Lake Livingston with beautiful views. The owner was available as needed and a very nice man. The house was big and comfortable. Has WiFi, TV in master with big shower and king bed. Three large bedrooms. Has fireplace in large living room for fall and winter use. I highly recommend this house and we will be back. My family had so much fun! Anything you forget is only a mile away or the town of Livingston is only 4 miles away to grocery stores, restaurants and WalMart. The house sits in a little cove with a sandy, beach bottom lake. The upstairs bedrooms have balconies to sit outside for morning coffee while watching squirrels and birds play. If you are looking for a great place to stay in or around Livingston, or on the lake, this is it!! I cannot say enough great things about the property and house. It was pet friendly and our 14 year old doxy felt right at home. I hope you love it as much as we did. Like I said, we will be back! Thank you for the great review. I enjoyed having you. I hope you come back. We had a amazing time at this fun lake house and will be back again soon. Robert was a pleasure to work with, thanks for sharing your beautiful home with our family. Thanks, I enjoyed your stay and our conversations. I hope you return soon. Awesome 3 nights. We had 3 of our grandchildren and they had a blast catching fish. Very nice house, well equipped. Very nice owner. Thank you for your response. I love to hear about the kids catching fish. I hope your will consider my house again. Swimming, fishing, skiing and relaxing. Jet ski and boat rentals near by also. Downtown Livingston, with Wal Mart, restaurants, and hospital, 6 miles. Nightly Rate: $250 - $250 Weekly Rate: $1400 - $1400 Monthly Rate: DNA $250.00 per night, $500 per weekend $1125 for 5 nights. $1400 weekly. based on 7 nights. 2 night stay minimum required. 3 night stay required on holidays. No more that 6 adults and children staying. Renters must be 25 or older, families preferred. Refundable security deposit of $300 and non-refundable cleaning fee $75.00 required. Dog fee is $125, if applicable, required.